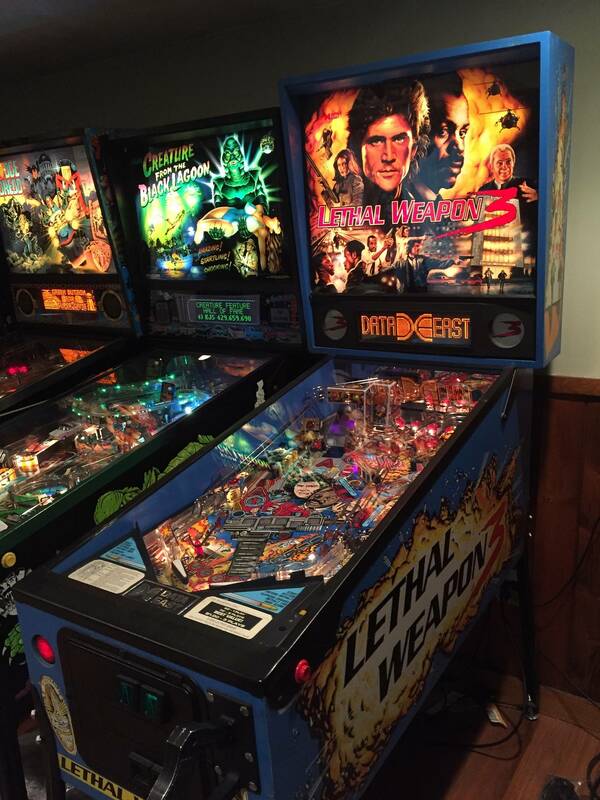 Hi have a chance of buying a Lethal weapon 3 machine, but the fuse holeder is loose and there for contact is broke, so the kick out and flippers do not operate. The seller tells me he has the correct parts they just need soldering on to the board. Is this correct and is it a simple job. Please advice what I should be paying for this and what ye true value would be if working. That doesn't seem like a hard job, if that's really all that's wrong with it. fuse holders (especially data east) commonly fail. Parts are less than a $1 a piece (so the fact he's offering the parts doesn't add any value). In the states a working one is worth maybe $1400 today. Not a hard job, but seeing how the seller isn't willing to fix it sort of devalues it on his end. I wouldn't pay more than $1k non working and that's a stretch. Be sure to check the boards first for any acid damage. I agree with everyone else, value is around 1300-1500 in decent condition. I like the game, a lot to shoot for and fast!. Great that really helpful guys Iam going over to view this week, like Toyotaboy says though if it's only that why isn't the guy sorting it himself. I love that ok ok ok ok ok . I dont find it annoying at all. Probably cause that's not all that's wrong with it or he has no idea what he's doing which then he's doing you a favor by not hacking it all up. I herd there is updated roms so Joe doesn't say okokok so much. Grab it imo. Fun pin. Sold mine 2 months ago but had it 5 years. Needed to rotate out. If the blue spinning topper works then it is more fun and appealing. The "ok ok ok" I think is addressed in updated ROM's. Mine was not bad and the previous owner informed me he had the newer ROM's installed. I was never annoyed by it. Not a complicated playfield with tons of moving toys but....at the same time that means there is not a lot to require new parts and labor...$$$ savings Video modes rock. I know I know....pinball is not supposed to need relying on dmd video modes. Still, they are fun in LW3. Grabbing the gun and shooting bad guys (while trying to avoid shooting ladies or cows) is fun...a change of pace....if you blow it off then it is a good time to sip/guzzle your BEEReverage Fun game. Try to inspect playfield well. Should be diamond coat...like a car finish. Not too many areas should be worn if any at all. Mine had a really well done finish. It was a reimport from Germany with tons of plays (on route) on it....still did not have even one spot worn through to wood. It was perfect in every way. Cabinet is another story. Nicked up bad but I did not mind. Try to make sure the original gun is installed. Very important for when(if) you re-sell it down the road. Check boards in upper cabinet. You do not need to be an electrician or expert here. Look for obvious things. Wire colors that are new and bright ...not matching surrounding wire colors, means jumpers/correction. If done correctly not a deal breaker, watch for how they appear. Tidy is good. A Pro does not jumper stuff and leave 2 foot extra wire dangling. It should be snug up and routed the same way as others. Look for burnt wires and/or wire ends. Black means overheated. Like mentioned, look for battery acid leakage damage at or below holder on board. Just glance around with a pen light and again, common sense look and you will do fine. Power game up and off 2-3-4 times. Make sure it boots fine. Ignore seller if speaking during this time with comments like" that is no big deal, always done that...it is normal..yada yada". If a game does not boot correctly (no hiccups or long pauses-manual interventions) then it usually is not good. GL! Fun game! Oh yeah. I sold mine in USA for $1,650 a few months ago. 9.6 Playfield (perfect finish, no raised inserts, no broken or missing plastics), 7.0 cabinet(knicked, scratches, scrapes, etc), 9.0 boards (1jumper at power board, done correctly. fuse holders were all tight/rigid). 8.5 Back glass (couple small knicks, not really obvious unless you look up close). I herd there is updated roms so Joe doesn't say okokok so much. This is good to know! Just picked one up for 1300. What WANDERERS wants, WANDERERS gets, ok ok ok ok ! fun game IMO and I gave it to my Big Bro for his 50th and now he loves it too! Supposed to shoot the cow in video mode; worth bonus points. Was Data Easts way of poking fun at Bally Williams. Fun game. If the seller knows what he's talking about (and tells the truth ) then it will be an easy fix. But for example, I serviced one the other week, similar problems. The flippers didn't work and neither did the shooter. One of the fuses was blown on the PPB board, and after replacing it, the shooter coil locked on (the shooter coil was also burned, and wired the wrong way, and there was another burned coil in the coinbox). So... It might be an easy fix, or there might be more to it. I think they fetch about €1000-1100 here in The Netherlands, not sure if that translates well to the value in the UK. I just sold mine last weekend for $1,100.00 to a buddy. Blue light didn't work anymore. Get Pin, fun to play.